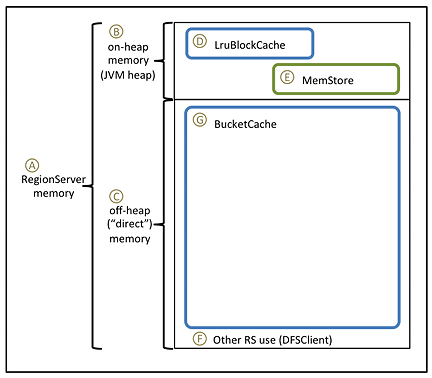 Before configuring off-heap memory, complete the tasks in the previous "Configuring BlockCache" section. To prepare for BucketCache configuration, compare the figure and table below before proceeding to the "Configuring BucketCache" steps. The first column refers to the elements in the figure. The second column describes each element and, if applicable, its associated variable or property name. The third column contains values and formulas. Most of the following values are specified in megabytes; three are proportions. This value was set when the BlockCache was configured. The hfile.block.cache.size property: Proportion of maximum JVM heap size (HBASE_HEAPSIZE, -Xmx) to allocate to BlockCache. The sum of this value plus the hbase.regionserver. global.memstore.size must not exceed 0.8. The hbase.regionserver. global.memstore.size property: Proportion of maximum JVM heap size (HBASE_HEAPSIZE, -Xmx) to allocate to MemStore. The sum of this value plus hfile.block.cache.size must be less than or equal to 0.8.